‘Following his swift coup d’etat, our youngest member Dave (recently entering his 30’s) “leads” an elite group of 12 older people that are worldly wise and armed with a vast array of skills. Some are even good modellers. We hope to make any newcomer welcome, as we are a friendly bunch and mostly normal. The layout is a small village terminus set in the midlands, in the early 1930’s. The country is just beginning to come out of the recession and Ash Valley is starting to show the green shoots of recovery. Skip to the end, if you want to know more. We are getting into rodding in a big way! Working Signals, points and telegraph poles are all presently being installed. The long closed mine is scheduled to reopen ‘soon’, with the intention of creating another point of interest along the layout. If we ever finish, we’ll think about going back on the road. Or just start again. The Ash Valley station throat area and warehouses. Set in the 1930’s, Ash Valley is the terminus of a branch line which connects to the main line at Ash Valley Junction. It was constructed towards the end of the 19th century just before the passing of the Light Railways Act of 1896. The line was used to move agricultural produce to large conurbations around the country. An agricultural machinery manufacturer and a meat products factory were built as Ash Valley was given rail access. Passenger traffic rapidly followed bringing visitors and residents to this rural area, resulting in the Midland Railway negotiating running rights over the branch line. The railway remained independent and escaped ‘The Grouping’ of 1923 with the LMS continuing to have the running rights to use the branch. Occasionally an LNER tank engine can be seen visiting the branch line. The AVR obtained locomotives from many of the pre-grouping companies and the architecture also bears a similar resemblance to the goods shed at Rowsley and the station at Oxenhope, both influenced by Midland design. The track in the station area resembles Amlych and was hand built with rails soldered to brass pins, the remainder being Peco™. 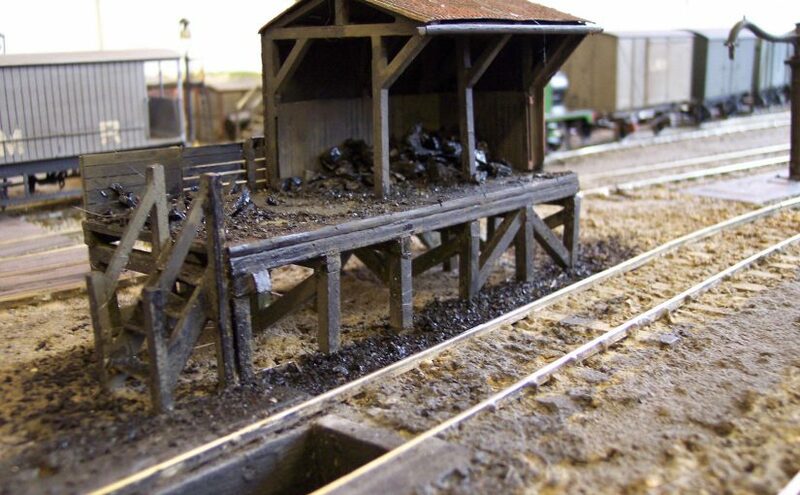 All buildings and structures are from areas within the Midland Railway region and are scratch built.